Unilever is pulling its controversial Baby Dove ad that has been accused of supporting those who oppose breastfeeding in public. 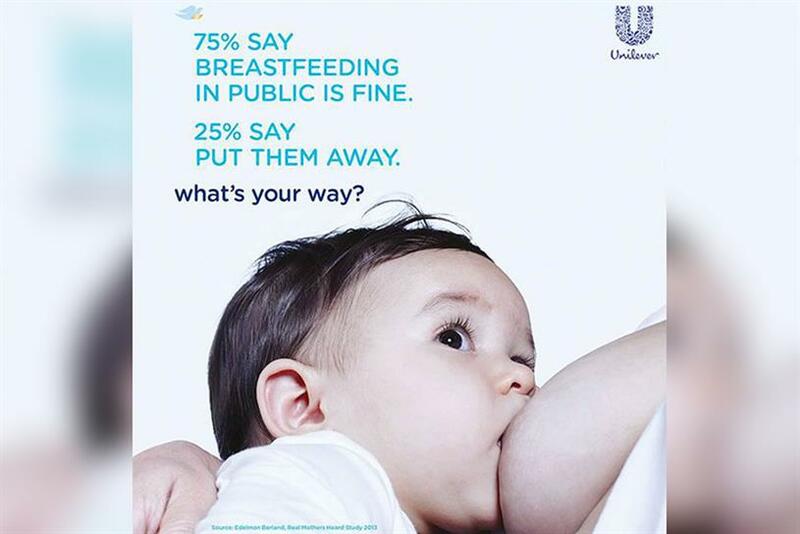 The brand’s nationwide ad campaign stated: "75% say breastfeeding in public is fine, 25% say put them away." It featured the strapline, "What’s your way?" The Advertising Standards Authority received 378 complaints about the campaign. However, a spokesman for the ASA said it would not be investigating further because "Dove has decided they will not run the ads again and to amend the wording on their website." A spokeswoman for Unilever said the ad did not come across as intended. In a statement, she said: "Our ad, as well as our campaign, aims to celebrate the diversity of parents and parenting choices in the UK. However, we realise that our message in this instance has not come across as we intended, and we did not mean to cause offence. For this reason we decided to review and stop further distribution of the ads in question." On its website Dove had written: "Using our baby products that gently nourish and care for your baby’s delicate skin is more caring way to do it your way. "Our mild and hypoallergenic baby products are even suitable for looking after your newborn. So whether you’re among the 66% who think that breastfeeding in public is fine, or the 34% who think otherwise, whatever choice you make, we are with you every step of the way." It is illegal to discriminate against anyone for how they feed their child in public in England and Wales, and it is illegal for anyone to ask a breastfeeding woman to leave a public place, such as a cafe, shop or public transport. Scottish law makes it an offence to deliberately prevent or stop a person from feeding milk to a child in their charge in a public place or licensed premises. Last year, a study published in medical journal The Lancet found that the rates of breastfeeding in the UK were the lowest in the world. Using issues in advertising for good or using issues for the good of advertising? Has Keith Weed steered us in the wrong direction on brand purpose?